Insulation is installed throughout a home to improve thermal resistance, increase comfort and lower energy bills. The methods and materials that are used to insulate each area can vary. Methods and materials used are also determined by whether the insulation is being installed in a new home or an existing home. Attics are often one of the easiest places in a house to insulate. 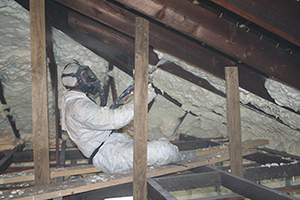 Typically, the best way to insulate an attic is with Icynene spray foam insulation. The spray foam provides insulation value as well as a complete air seal, leading to an extremely tight and energy efficient attic space. Another choice to consider is blown-in insulation. The insulation is blown over the top of existing insulation or floor space, to increase the R-value of the home. Recessed can lights and other utility penetrations. Chimneys and chases adjacent to exterior walls. There are a variety of products we can use when insulating or reinsulating an attic. Properly insulated exterior walls of your home will not only increase comfort but also help you save on heating and cooling costs. Many people think that adding insulation to an attic alone will provide adequate energy savings. Although attic insulation is important, a home experiences 15% heat loss form air leaks and poor insulation in exterior walls. Neglecting sidewall insulation allows for continued energy loss and higher energy bills than are necessary. Sidewall insulation can be added to existing homes through the exterior of the home. There are different forms of insulation that can be installed into walls, including cellulose and fiberglass. 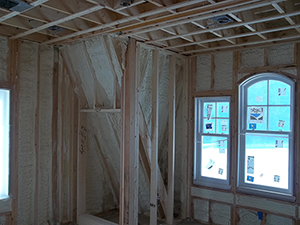 Foam insulation can be installed in walls of new construction. One of the most important areas of a basement to insulate and air seal is the basement box sill. Spray foam insulation can be added to box sills in both new homes and existing homes. Adding spray foam insulation to basement box sills prevents unwanted air infiltration from entering the home and conditioned air is prevented from escaping. Crawl spaces under homes can cause many problems for homeowners. A crawl space is vulnerable to moisture and deterioration problems. Because soil has high humidity, a crawl space naturally becomes damp as the crawl space is in direct contact with the soil. Damp environments are unhealthy, harboring mold and creating an ideal living space for pets. Think damp space is isolated and doesn't affect the interior of your home? Think again. The natural airflow of a home is from bottom to top (ground to sky). As your home naturally breathes, the moist air (and everything in it) flows up and not the living areas of the home. We use spray foam insulation to seal crawl spaces. Anchor Insulation has offices and crews throughout Rhode Island ( RI ), Massachusetts ( MA ) and Connecticut ( CT ). Contact us today for your wall insulation, basement insulation, or attic insulation needs.